Last week, we were invited to a tasting at Terroir in San Francisco to sample the wines produced by Batič in the Vipava Valley of Slovenia and imported by Blue Danube Wine. 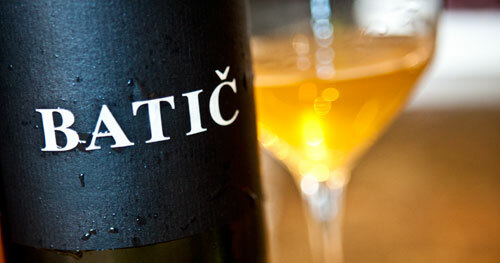 Batič has been making wines since it was founded in 1592. All of their wines are both organic and biodynamic (the later of which is being seen at more and more Slovenian wineries). Overall, the wines are stellar and incredibly unique in character and style giving anyone who has the chance to taste them a welcome change up from the “norm” that usually circulates around San Francisco (high alcohol and oak Napa/Sonoma wines or generally cheaper, bland bulk imports from France, Spain, and Italy). 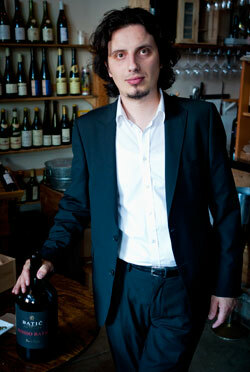 These days, the winery is run by Miha Batič and his father, Ivan. With their wealth of family wine history behind them, these days, the majority of their production is of white wine. One of which we started with was the 2009 Rebula. A product of natural fermentation, the body is effervescent and dry with a touch of minerality and that slightly “wild” element you get when a wine is naturally fermented (we welcome this by the way). At 13% alcohol, it is easy to drink and an excellent wine for a warm day or to accompany a light meal. From the Rebula, we moved on to the 2008 Pinela. At 14.5% alcohol, this white (and Batič is one of the very few wineries producing it) spends 1 1/2 years in Slovenian oak. The nose has a light, pleasant cantaloupe aroma to it and the body is crisp and bright, almost akin to freshly-made popcorn. With a nice, even acidity, it would be great with any manner of fish or fowl. The 2010 Rosé is based on a Cabernet Franc and is just 12% alcohol. While we’re often not fans of the oft-neglected Rosé, this one was quite, quite good. It’s a balanced wine with a nose that has slight hints of papaya. The body has small traces of cinnamon elements to it all and pulled together in a Rosé that could be had at any time of the year and a great choice to have near the end of a meal. The 2009 Zaria is a blend of 25% Pinela, 25% Rebula, and 50% Zelen. The last wine in the blend is interesting as it literally means, “green” in Slovenian and is a wine that is not really drank on its own given that it tends to only have 10% alcohol at most. Laughingly, it’s often associated with fertility and colloquially referred to as the “baby maker” despite the light alcohol. The nose of the Zaria has a bit of beeswax and a bit of citric lime qualities to it. The citrus carries in to the body as well. This white has prolonged skin contact and as such, it carries many of the characteristics found in wines that are aged this way. We were a bit divided on it and found that depending on who tasted it, the wine either seemed muddled due to the varietals used or on the opposite end, rather complex with each of the best parts of these grapes coming through. Obviously, taste is subjective which means that if you get the chance, you should try it for yourself. Last on the official list was the 2008 Cabernet Franc. This wine is at 14% alcohol and is a much deeper wine than previous vintages have been. It has a floral, dry earth nose that boasts a light touch of plum to it. The body is also dry with the plum aspects present as well. While boasting a pleasing acidity, the wine is at the same time smooth and plush with a finish that lingers just perfectly. Batič also produces a Grand Cuveé which is called, Rosso. It’s their highest-end wine which means that the grapes need to be of an outstanding character for the wine to even be produced. 2006 was the last year they produced the wine and thankfully, Miha brought along a magnum for everyone to have a small taste. It’s a blend of 70% Merlot and the rest comprised of Cabernet Franc and Cabernet Sauvignon. 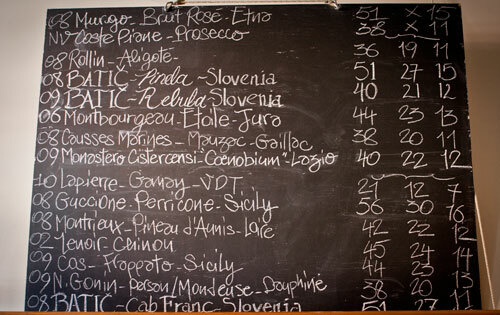 The wine is bold and, as much as we don’t like these types of comparisons, “French-styled”. It would be great for large meals comprised of hearty meats such as steak or venison as the body is robust and deep. While obviously oaked, it is a subtle oak that glides over the wine, coating it in the most enjoyable of flavors and tying up the blend succinctly. This tasting was great in that in addition to sampling some delicious new vintages of wine, it finally allowed us to meet Miha after hearing so much about the wine his family is making. It also gave us a chance to spend more time at Terroir which, if you are in San Francisco, you should really check out if you haven’t already.